There is no better way to explore the Canadian Rockies than Canmore. Less than an hour from the Calgary International Airport, this fully furnished 2 bed, 2 bath condo offers a rustic decor including a southern exposure with views stretching from the Three Sisters in the East to the Rundle Range in the West. Warm yourself with a cup of coffee as you watch the sunrise climb the mountaintops. Minutes from Banff National Park and the Banff town-site, Canmore provides all the wilderness and shopping access you seek, with none of the hustle and crowds of Banff. After the day's adventures, enjoy a soak in one of three outdoor hot tubs or the 4 season pool. 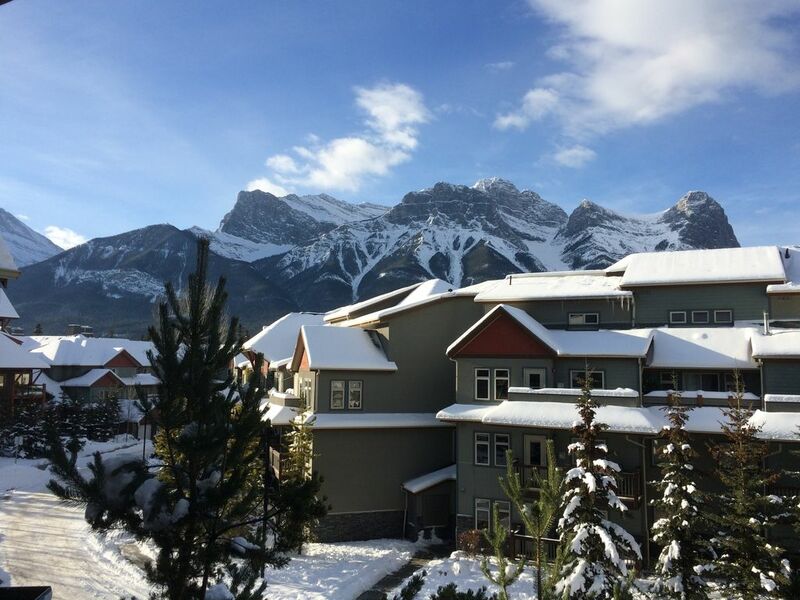 This condo is a short walk to Elevation Place, expansive grocery facilities and the downtown district beyond, where you'll find an eclectic variety of shops and restaurants unique to Canmore. This second floor condo has heated indoor parking for cars and bikes and elevator access. Prepare your meals in a fully equipped kitchen or grill some steaks on the gas grill out on the deck, while taking in the spectacular view. The living-room is furnished with leather sofa bed and chair, writing desk, gas fireplace, A/C, 48" flat-screen, cable and wifi. In The Master Bedroom, you'll find a custom built Queen sized log bed, TV, and full en-suite bathroom. Bedroom 2 is furnished with a custom built log bunk bed - twin over queen and a third TV. This unit will accommodate 6 - 7 people comfortably. Additional amenities include in-suite laundry and fitness facilities. This property is in a secure building away from hustle and traffic, so you barely feel like you're in town at all. Quiet times observed between 10:00 pm and 7:00 am ensure a peaceful and relaxing vacation. Park Pass available for tenant use. Please note that prices may be displayed as US funds by VRBO, then transferred into CDN funds after purchase, resulting in higher than expected transaction totals. We apologize, but we are unable to change this feature on the site. Great location and homey atmosphere. It was perfect with the kids! Everything we could have needed for our trip! What a great location and accomidations! We will hopefully be coming back another time. Glad you enjoyed your stay! Come back any time, Marisa. We'd be happy to have you. Clean and well cared for. Comfortable for all. Everything you need for a weekend away. Well stocked kitchen with basic spices and condiments. Only thing missing for us was a blender, but we were able to bring our own. Was nice to have TVs in each room. We will definitely want to return. Thanks for an amazing weekend. Glad you enjoyed your stay Charlene. We’ll have that blender added by the end of the month. We look forward to hosting you in the future. What a great spot to get away to the mountains! Really nicely designed, clean, and well taken care of condo. Great view of the mountains, a hot tub just out the door to relax in, and a cozy fireplace to relax around after a day of exploring and skiing. The owners were helpful and friendly and everything was taken care of in advance of our arrival. We could not have asked for a better place to stay. Will be back here again! This condo was perfectly situated for our family since it includes bunk beds, laundry, and a functionally stocked kitchen. We skied at nearby Lake Louise and Sunshine Valley. We rented our ski equipment from Gear Up and also enjoyed dog sledding with Howling Dog tours and walked Johnston Canyon though White Mountain tours. Everything you need is close and convenient which makes vacationing that much easier! We chose to eat in most nights and was able to find everything I needed in the kitchen. Even though there was a slight hiccup with the last renters forgetting to leave the park pass Steven was on top of it and let us know before we even arrived. He quickly refunded the cost of the pass for us and it quickly became a non-issue. He communicates well and is quick to respond. I would highly recommend renting at this property. Glad you enjoyed your stay Greg. Come back anytime! Clean and comfortable. Great view!